Sticking with their 2 week patching schedule Hi-Rez Studios have released yet another update for the increasingly popular free-to-play MOBA game, SMITE. This weeks patch sees the introduction of a brand new god, several new Gold Skins, rank 10 rewards, new voice packs and a huge change to the way Jungle buffs work. Of course the biggest aspect of the update, as always, is the addition of the latest God, Chronos The Keeper of Time. 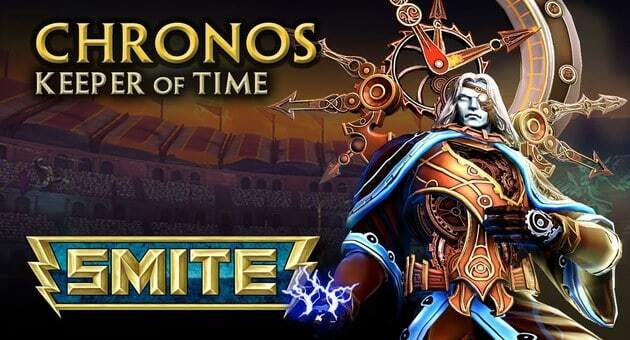 Originally discovered last month, following relentless data-mining efforts by the SMITE community, Chronos is yet another God that brings with him an exciting variety of never before seen God mechanics and features to the MOBA genre. He has an impressive list of skills including the ability to slow and stun enemies, increase movement and attack speed, and even rewind time to fully restore HP and mana. For the full lowdown you can watch the official God reveal below. Accompanying Chronos is some exciting reward-based feature updates including the Gold & Onyx skins for those skilled enough to reach rank 10 with a particular God. Currently only Anhur and Loki have these skins but as with the original Gold Skins, more will be added over time. Zeus received a new skin in the form of Young Zeus and He-Bo got the Gold Skin attention this week despite the massive popularity of his previously released He-Bro skin. Match this all up with new voice packs for Vulcan, Poseidon and Chronos; and you’ve got one of the biggest God content updates in weeks. Finally the changes to the Jungle. Following the previous patch, that was met with very mixed reactions from the community, Hi-Rez have decided to change the way Jungle buffs work. Upon death the leader of a Jungle Camp will now drop an item on the floor that must be claimed to make the buff active however each individual is now only able to sustain a single Jungle buff. Do they want a Jungle role? Do they want to avoid a Jungle role? I really have no idea. What are your thoughts?